This is the real thing! Yoo Jinwoo & Jung Heejoo is official! The ever reliable Dispatch. Great job! After watching the church scene in preview, I remember the pic where HJ, sec seo and zombie cha are together and posing. I think we will see that scene tmr in church!! Also I have question. When 2 Users meet each other, either they should form ally or enemies right? But I didn't see that when JW and HJ met. Did I miss something? They will only see there are other users, not necessary enemy or ally, I think. Out of curiosity, do they have an actual video game being considered for development from this drama? Hope so! I miss Sec Seo. No such scene. Usually that's the case. Between the two option, I think Jinwoo would rather choose Enemy than risking Heejoo as ally. Question 1: Why did you pick augmented reality as your theme? While preparing for a new project, I tried an augmented reality game out of curiosity. This drew my attention and made me think, could there be a meticulous game where you could not distinguish reality from virtual reality? I had so many thoughts to tell while thinking of the possibilities. Gosh she played...stubborn HJ...! Ggrrrr...! Got my zombie ready...was late for the party...slept on my side of the world...! Congratulations to the grinners...! Beware...! We will all hunt youuuhhhh...! Bwahahaha! Hellooooo, I just finished ep 13 and it was awesome!!! I'm so glad Emma has more to do than just giving life points, and we finally have some sort of answer. I still stand by my word and my wish to get rid of Yu Ra, she's just such an annoying character who does nothing but annoy other characters. I understand if the writer wanted to make the story about a woman and her getting the key, but I don't like the fact she involved religion and important people in it to achieve her idea, she could've made the story about the princess of Alhambra o something, sigh, I knew religion would come up in the drama but I didn't think she would be this misinformed, koreans really don't know about Islam. Anyways I just wanted to let you all know about this, just a nother reminder that writers need to research their information, other than that GREAT episode, I like it very very very much that the key should be given to Emma, let's see what tomorrow's episode will bring. Hola....much gracias to our Zombies making me wake to another world. I love it! So I am not really good at following the form lol but I realized some people were wondering what happened today. so I haven’t watched the episode on Netflix yet but if someone can confirm my theory that’ll be great. 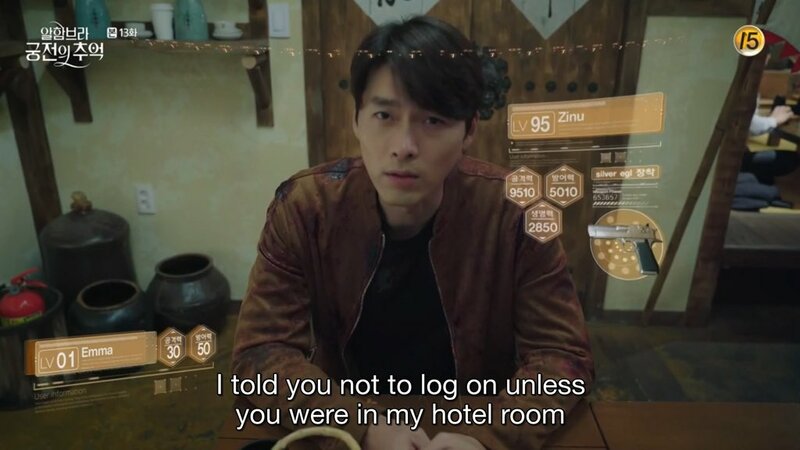 So At the beginning I am sure JW mentions that he thinks all this started cause of Emma.. because how she saw SeJu getting hurt and she was playing MOA. So connect rain and the song, that’s where the game went wrong and emotions were put in. So so here we go, my theory and explanation; rain is a resemblance of think of it at Emma’s tears. So in the game JW kills Hyeon-seok with vengeful feelings, not just for the sake of playing the game. Now recall how Marco stabbed SeJu... again, vengeful feelings but that’s where it started. So basically Emma idk what kind of NPC SeJu creates caused the glitch to happen in the first place.